I didn’t mean to be quite so critical of the Scholastic “100 Greatest Books for Kids” list in my last post. As someone who started a blog that’s all about recommending great children’s books to readers, I think I can understand the noble aspirations that are probably behind the creation of the list and I definitely can see how some people might find a “100 Greatest” list valuable. However, that being said, I still think the overly sensational presentation of the list robs it of a large portion of its inherent value. Yes, it’s great that some very educated, very passionate people assembled such a strong reading list, BUT I think their contributions are overshadowed by the over-the-top pomp and circumstance of suggesting that these 100 books hold more value than ANY other children’s titles. 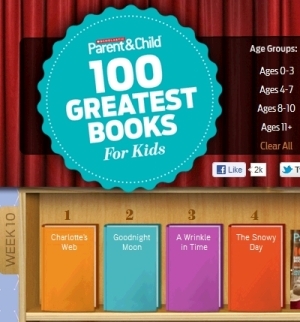 The “100 Greatest Books for Kids” opted for the inflammatory over the educational, and I think that was a bad call. But that isn’t to say that “best book lists” are always a bad idea. They can be AMAZING, when they’re done right. So, in response to Scholastic’s “100 Greatest Books for Kids”, I thought I’d pass along five other examples of “Best Books for Kids” lists that (I think) present their recommendations in much more constructive and enlightening ways. The other great aspect of this list is that the NEA suggests that you cross-reference the list with a 2007 survey they did where teachers were asked to select their top 100 examples of quality literature for children – you can read that list here. There are some FANTASTIC suggestions on the teacher list – I prefer their picks to the kids’ list – and I think the teachers did a much better job of creating a balanced selection of new and iconic titles than the Scholastic list did. Granted, there is NO commentary to accompany these lists – it’s just a big dump of titles – but I think their selections and the perspective that they bring on their respective audiences make up for that shortcoming. The editorial team of the Guardian has done a blisteringly admirable job of putting together a primer for any parent looking to assemble a list of “classic” children’s titles for their kids. They break their recommendations into several different age groups – Classic children’s library: 0-3; Classic children’s library: 4-7; Books for tweens; and Teen library – and they provide some excellent and well-written commentary to accompany each title. More than any other “best books” list I’ve found online, the Guardian‘s recommendations do an amazing job of providing context for each title and really giving a nice, concise argument of WHY this title is perfect for its age group. (They also pick many wonderful-sounding UK titles that might not be familiar to US audiences – that’s another plus in my column.) 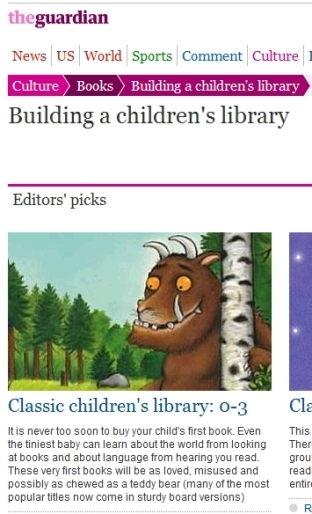 One warning: The Guardian’s “Building a Children’s Library” site seemingly hasn’t been updated since around 2005 – and some lists date back to 2000 – which is a shame. The books selected have not been chosen on any criteria other than that we have read and enjoyed them and think you and your children might too. They have not been selected because they have any particular educational value, tie in with the National Curriculum or might help your child learn to read, although some will probably do all these things. These books are not about fact gathering, but about finding out about the world around us in the widest sense and sharing in the pleasure of that discovery. You should visit this site daily. This is one of my favorite sites on the web and it revolves around a very simple, powerful, and elegant concept. 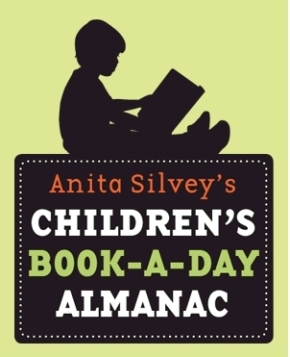 Anita Silvey, a renowned children’s literature scholar and publisher – she was the editor of The Horn Book and published children’s books at Houghton Mifflin – offers her readers a new book recommendation for every day of the calendar year. She has assembled a wonderful selection of recommended titles and, every day, she not only recommends a new book, but she also gives background information on the book and author, she identifies the idea target audience for the book, she classifies the book into different helpful categories, she offers further reading suggestions – the sheer amount of content she presents to her readers in the Book-a-Day Almanac is breathtaking. And Silvey has such a depth of knowledge and obvious affinity for children’s literature that you couldn’t hope to hear from a better subject matter expert in the field. She also edited a really cool reference book titled The Essential Guide to Children’s Books and Their Creators, a title that ANY kid-lit obsessed parent should own. The volume is organized around authors and illustrators, giving commentary on their careers and their essential works, and, on a whole, it’s a fascinating look at the people responsible for creating some of the best books ever written. There’s also an epic “recommended reading list” at the beginning of The Essential Guide to Children’s Books that breaks down an impressive selection of reading suggestions structured around different age groups. The list will be as up-to-date as the edition you find and, regrettably, I can’t find a copy of the list online yet, but it’s worth seeking out. Common Sense Media is an interesting non-profit organization. According to one of their ten core beliefs, they recognize that “media has truly become ‘the other parent’ in our kids’ lives, powerfully affecting their mental, physical, and social development” – which, while a scary statement, is also eerily true. CSM is an advocacy group and it monitors the different media channels hitting your kids (books, video games, movies, websites, apps, etc.) and offers related recommendations, reviews, educator resources, and advice. I normally shy away from "watchdog" groups, but CSM has made some really strong reading lists for kids. While I do disagree with some of CSM’s tactics when it comes to trying to lobby states to prohibit the sale of certain video games to minors, I DO really, really like their big selection of themed reading lists, which do a wonderful job of creating connections between titles AND offering up some great reviews and age-group ratings as well. (You can find them here.) The CSM reading lists are perfect for people who want to browse for book recommendations by theme rather than a blanket “best” categorization. Their lists include titles like: What to Read After The Hunger Games; Romantic Fantasy Books for Teens; Love Books for Little Ones; Strong Female Characters in Books (YES! ); Vampires, Werewolves, and Zombies Books; Kids’ Books About 9/11; Books That Teach Empathy; Teen Romance Novels: Completely Vampire Free! (Double YES! ); Books That Celebrate Libraries, and many, many more. It’s a really well done, well maintained reading resource for parents and kids. Consider me impressed. Reach under your seats, dear readers, and... I've got nothing. Sorry. 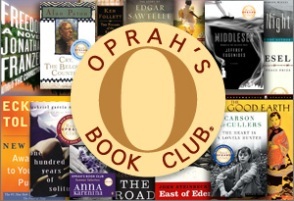 It’s a little annoying that some of the lists are broken up over multiple pages – so, if a list has 17 books, you’ll have to click “next” 17 times – but Oprah’s editors and the ALA offer a nice, wide selection of recommendations along with some other great content, including recommended read lists from Michelle Obama, Katherine Paterson, and some other big-name figures in children’s lit. It doesn’t look like these picks have been updated since 2010, but they’re still definitely worth checking out – particularly if you’re a closeted Oprah addict. Thanks a lot for sharing these lists and also your take on them. Love your site! Is there a way I can subscribe by email?